No, not just any old log, the best English walnut log we’ve ever had. 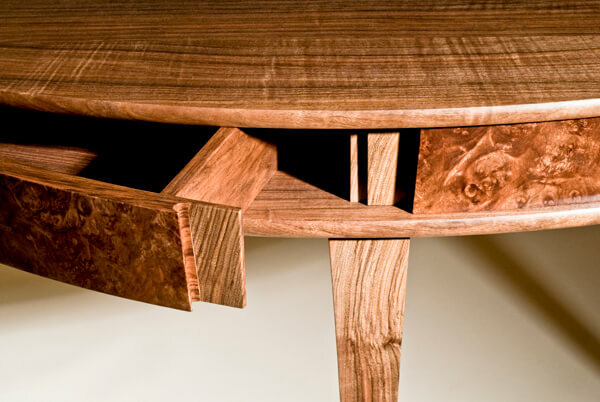 Back in 2007 we were commissioned to design and make a desk in native walnut, by a client with impeccable taste and a real eye for detail. At the time we didn’t have any walnut so the search started. It’s never easy to find good walnut, they are rare individual trees usually growing in gardens or on estates. This is very different from commercial timber extraction where large stands of trees are removed. The economics obviously makes far more sense on the latter. After many calls and false leads we found a log which had not been cut yet. It was with a dealer based in Herefordshire so John and I went up to have a look. 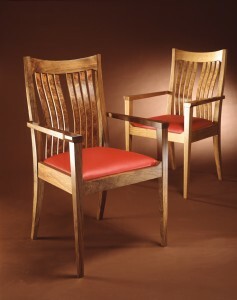 We were also looking for a very large oak for a 14 seat dining table with chairs. 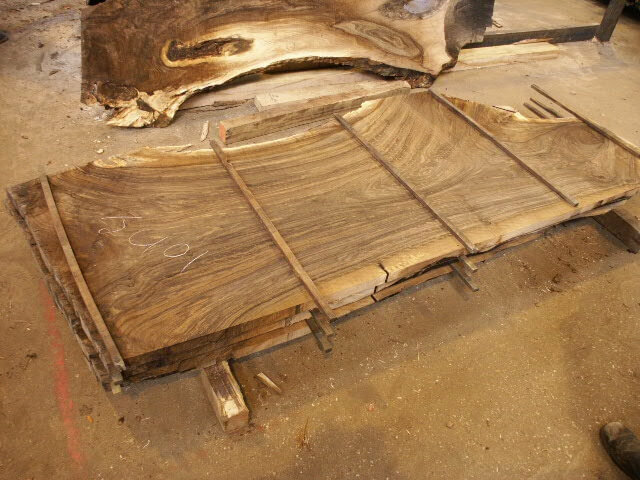 We bought the English walnut and also found a Scottish ripple oak log for the dining set job, so it was a very worthwhile trip. Both needed to be dried so it was not going to be a quick process. 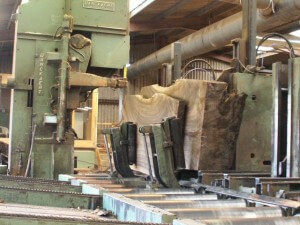 The logs went to Lincolnshire to Specialist Timber Services to be dried and then cut. As I had not seen what the walnut looked like inside the deal was I would be present when the log was cut and could reject it if it was poor in character or rotten. Luckily it exceeded all our expectations. 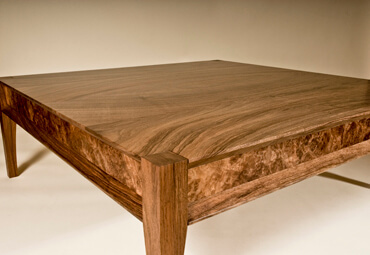 The walnut was around 2.5m long and around 90cm wide, full of colour and character. On one side the grain was straight, on the other was a broad sweeping curved grain. There was even ripple in the lower half of the log. We cut a mix of 1.5 inch, 2 inch and 3 inch from the same log yelling over 80 cubic feet of stunning usable timber. It cost us around £5000 and the client had to wait patiently for 9 months! As well as that initial desk project over the last 4 years we have also made numerous other pieces from this spectacular wood: 3 of our ‘Oryx2’ Armchairs (as one of a contrasting pair), a pair of curved front console tables with pivot drawers, and a large low coffee table. Now we are coming to the end of that log and we have decided to use what’s left to make one more piece; fitting then that it will be a desk, like the first piece we made. This one is smaller, more delicate and exquisitly proportioned. 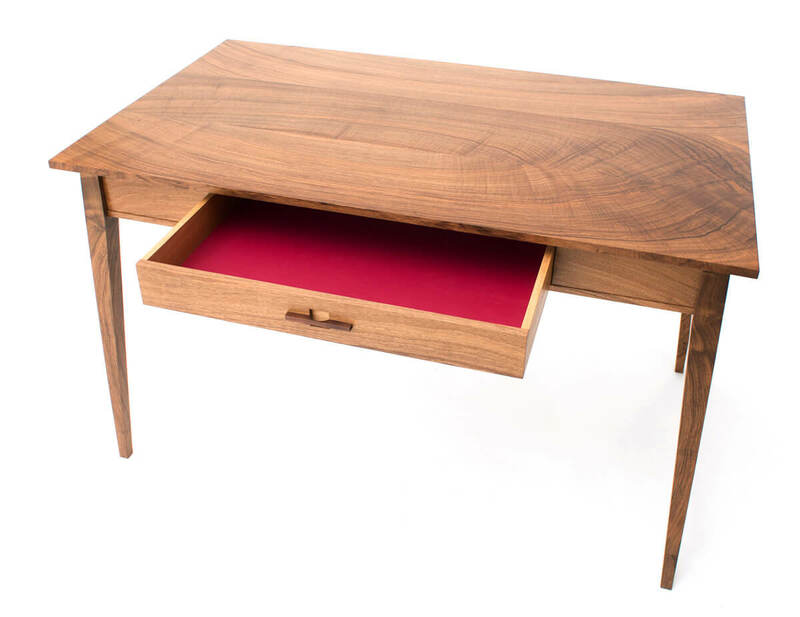 There is one oak drawer with raspberry leather lining. It sums where we are in terms of design and attitude to materials; beautiful simplicity allowing the timber to tell its own story. The desk, which we have called ‘Ronald’ is just back from the sprayers. It’s brought the best out of that amazing grain and is looking wonderful, the drawer interior also gives a great flash of colour when you least expect it.